My friend Dawn (runs our rabbit rescue) reads the blog post and calls another friend Kate (does rabbit rescue and poodle rescue, but I didn’t know she knew some folks in cocker rescue!). Kate contacts her cocker rescue people and starts the conversation about helping this dog. They say this pound doesn’t have a very good record with scared cockers, unfotunately. A shelter volunteer recently had to plead with staff to save a cocker’s life by letting it go to rescue. Kate calls the pound and gets the dog’s ID and learns he has been tagged “very fearful,” which is basically a death sentence. I think he was only being held because strays are kept for a certain number of days. Kate asks the pound to call her before euthanizing him. Meanwhile, a cocker rescue says they will take him if the pound will release him to them, and Kate finds a helpful person at the shelter too! Doggie goes to his rescue foster home on Tuesday! The pound had given the pup a heartworm test but couldn’t vaccinate him because he was fearful and wanted to bite. 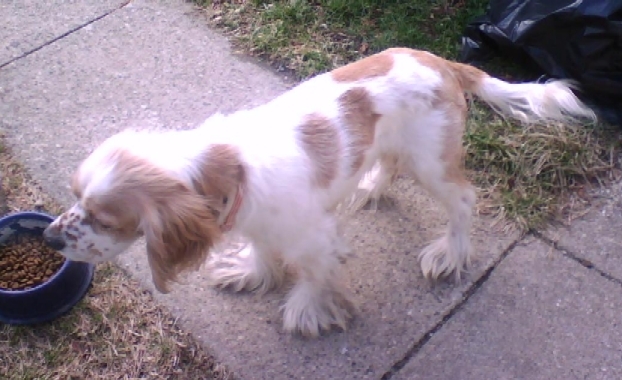 The foster home says he’s doing better now that he is in a safer environment and he will be bathed/groomed today. They think he’s just over a year old but has been outside fending for himself most of that time. Hooray for the saved doggie! Thanks to Indy Cocker Haven and Indiana Cocker Rescue for helping! Thank you for sending me Amy’s assessment of “Nicky”. At least this is the new name I have given him and he seems to like it. Yes, he is now jumping on me and acting quite Jolly when free and runs right outside and has now learned to go into his crate for a treat. We did tackle some grooming and a bath this evening which was not fun for Nicky or for me. He was terrified of just the scissors, let alone a razor, so we had to drag out the muzzle, so that I could at least trim all of the mats out with the scissors before getting a bath. I was able to trim one foot of toe nails, but will wait for help to hold him to finish that as well as any razor triming on his face. We did his bath and once I saw that he was going to settle down in the tub I removed the muzzle so we could have a clean face as well. He actually was quite good with the bath and it was a good thing as he was loaded with fleas, which I suspicioned . At least he now is flea free and clean and partially trimmed. I decided when he goes down to be neutered , they can trim his nails and his muzzle while he is under anesthesia. This will help this time and let him settle in easier before having to endure the final grooming . They don’t usually mind the clippers on there neck etc, like they do there muzzle. I think he will be okey, but I don’t feel I will place him with children. Might have to watch that biting when he gets scared or is in strange situations. This entry was posted in Indianapolis and beyond, Pets/Rescue by Amy. Bookmark the permalink. Oh, thanks goodness! That poor bippy – no wonder he’s “very fearful.” He’s been on the streets! Thanks, Amy! We’re all in this together. St. Francis must be smiling at this one! Oooh, I’m sorry my ‘De Animals’ post made you sad. I can see why it would. If it helps at all, remember I’m writing ironically. I really adore my horses, and the cats, too, even though they now outnumber people in my household (which is quite an accomplishment). I don’t have any problem with other people’s dogs, or even stray dogs, as long as they don’t eat my chickens. That makes me mad. But I sincerely admire and applaud the things you do for so many animals, Amy. Honest.